I’ve actually been writing about oats for so long that I forgot just how long. My first article on oats was published in the scientific literature in 1997—21 years ago versus the 15 years I stated in the post! The sheer volume of questions submitted makes it impossible to answer them in one post. 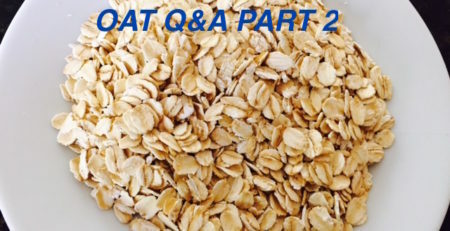 This is the first of who knows how many Q&A posts on oats. Some of your questions may have been slightly modified for clarity or combined with other similar questions. Q: My understanding is that oats are gluten-free in and of themselves. However, is it the processing or the mixing with other non-gluten-free products that makes them problematic? A: Oats are considered a naturally gluten-free grain. However, a certain percentage of folks with celiac disease have an immune response to a protein in oats called avenin. We will address this issue in a later post. The main issue with oats is cross contact with wheat, barley, and rye. This cross contact can occur anywhere from the field to the mill to the food processing facility. Oats may be grown in rotation with or in proximity to wheat, barley, or rye. If so, it is likely that there will be errant wheat, barley, or rye grain growing in the oat field that will be harvested along with the oats. The same harvesting, transporting, and storing equipment/facilities may be used for oats as well as for wheat, barley, and rye. All of these factors contribute to the presence of wheat, barley, and rye grain in standard oats. Q: Is “optical sorting” of oats sufficient rather than a more guaranteed “purity oats” situation? A: In the opinion of Gluten Free Watchdog–NO (generally speaking). Purity protocol oats are produced following steps to control the presence of gluten-containing grain beginning with the seed used for planting. 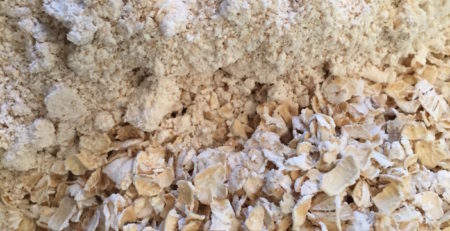 The protocols followed by the suppliers of purity protocol oats included in the listing maintained by Gluten Free Watchdog (e.g., Avena Foods, GF Harvest, Montana Gluten-Free Processors, Glanbia) are outlined at https://www.glutenfreewatchdog.org/news/oats-produced-under-a-gluten-free-purity-protocol-listing-of-suppliers-and-manufacturers/ and on supplier websites. Sorted oats are traditionally grown oats that undergo a sorting process at the mill to remove gluten-containing grain based on a variety of grain properties (e.g., size and color). 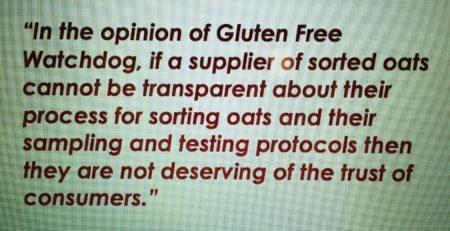 Sampling and testing protocols followed by the various suppliers of sorted oats are outlined at https://www.glutenfreewatchdog.org/news/controversy-continues-to-swirl-around-oats-their-suitability-for-a-gluten-free-diet/. At this time, the only sorted oat products Gluten Free Watchdog is supportive of are Quaker gluten-free oats. Q: How do you know if oats are gluten free? A: If a manufacturer believes a single ingredient oat product, such as rolled oats, oat flour, etc. is gluten-free it will be labeled gluten-free. If a single ingredient oat product is produced following a purity protocol, the manufacturer will likely convey this somewhere on product packaging. Unfortunately, if a multi-ingredient product labeled gluten-free contains oats, it is sometimes difficult to know whether the oats used are standard, produced following a purity protocol, or mechanically or optically sorted. Q: If I buy oats that say “made with certified gluten-free oats” in the ingredients list or on the food label does that mean they are purity protocol oats? A: No. “Certified gluten-free oats” does NOT necessarily mean the oats are purity protocol oats. Certification organizations, including GFCO and GFCP certify single ingredient oat products (e.g., rolled oats) and multi-ingredient products containing oats (e.g., granola) that utilize oats produced following a purity protocol as well as standard oats that undergo mechanical or optical sorting. Q: Why can’t I automatically trust the “certified gluten free” label I see on granola and other oat based products? Are certified gluten free oats always safe? A: It depends what you mean by “trust.” If you mean, “Why can’t I trust that the oats are produced following a purity protocol” the answer is because both GFCO and GFCP certify products made using oats from suppliers of sorted oats. Q: Are certified gluten free oats always safe? A: It depends on what you mean by safe. “Certified gluten-free oats” does NOT necessarily mean the oats are purity protocol oats. Q: I only eat products that specify “gluten free oats” but have noticed several products that are labeled gluten free, yet the ingredients don’t say “gluten free oats”. Is there any regulation on this? A: FDA does not want manufacturers using the term gluten-free in an ingredients list. Q: Why don’t purity protocol providers have a badge/seal on oats as well as oat-containing products that use only purity protocol oats? A: A purity protocol seal that could be used by suppliers and manufacturers makes sense. A seal would certainly make it easier for consumers to spot products. Questions to think about: Who should develop the protocol? Currently there is no single protocol followed by suppliers of purity protocol oats (although the steps they take are very similar). Certainly the current suppliers—Avena, GF Harvest, Montana Gluten Free Processors, and Glanbia know best about how to control for wheat, barley, and rye during growing, harvesting, transporting, and storing. Maybe in combination with those who know a lot about sampling and testing and the patterns of cross contact with wheat and barley (contamination is spotty and occurs in pockets), a rigorous agreed upon standard could be developed. Who should oversee this standard—both production and testing—and provide this seal? These are a couple of the questions that have to be answered. Q: Why are certifying agencies allowing sorted oats to be certified? A: You will have to ask them. Q: Where is the FDA on all of this? A: Oats—whether purity protocol, sorted, or standard—can be used in a labeled gluten-free food. Under the FDA’s gluten-free labeling rule, the final food product must contain less than 20 parts per million of gluten. However, testing is not a requirement of the FDA’s rule. Even when manufacturers are testing, the gluten level in oats may be underestimated due to the nature of cross contact with wheat and barley (when present, wheat and barley grain are not evenly distributed in oats). This is why sampling of oats for testing is so important. Q: In an ideal world, given the current state of knowledge on this topic, how would oats be regulated by FDA for gluten-free labeling purposes? A: In my ideal world, oats used in labeled gluten-free foods would be produced following a standardized purity protocol and also undergo some degree of mechanical and/or optical sorting to check for any errant grain. A farmer can control a lot of factors but he cannot control birds flying over an oat field. Also in my ideal world, standardized and rigorous sampling and testing protocols would be required for all oats used in labeled gluten-free foods. If you have follow-up questions, please post them in the comments section. Thank you! Bob’s red mill? I’ve been eating almost daily for years with no problems. What are your thoughts on made good granola bars? Made Good was removed from the listing of manufacturers using purity protocol oats. They changed suppliers and refused to name their new supplier. I have 2 questions if you dont mind. 1) i actually have a product (i believe quest bars ) which state on the package certifed gluten free but also states on the package that its made in a facility which processes wheat – these 2 claims seem paradoxical so how can a product be both certifed gluten free and also made in a facility which process wheat? 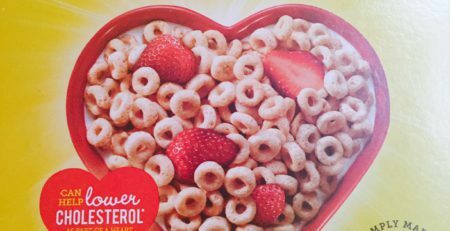 General Mills removing gluten-free claim from Cheerios in Canada: Implications for US market?